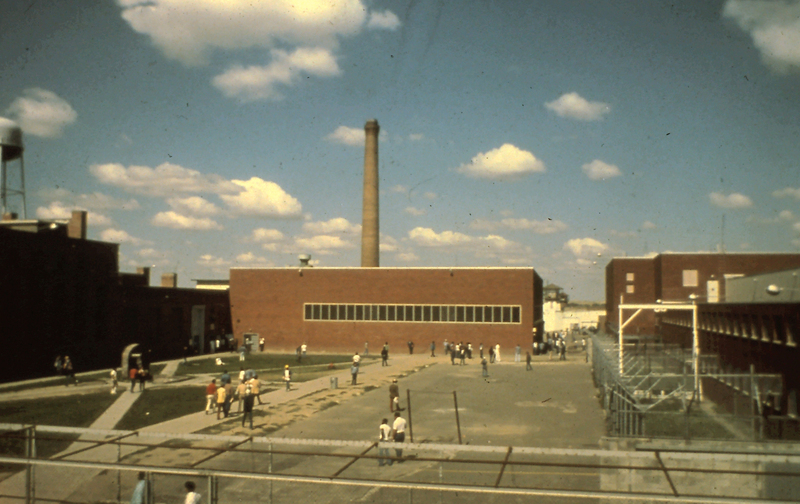 Shortly after allowing the creation of Lifers’ Park at the penitentiary in April 1970, Superintendent Rhay authorized the Resident Government Council (RGC) to be in charge of what he called “a People’s Park area.” Formerly off-limits (inmates were required to keep to paved pathways), People’s Park was originally a grassy area next to Seven Wing, and south of the dining halls. It was later expanded when Rhay’s successor had the Lifers’ Construction Crew tear down the wall around what had been the outdoor exercise yard for men in segregation. The picture below is likely from 1978, after the wall around the segregation yard was demolished.